Affiliate Program Website - SEO Optimized, functional and trusted online presence for your business partnership avenue. Affiliate program FAQ, product portfolio, affiliate signup procedure documentation. Affiliate Tracking Software – installed, tested and functional. Creative – Industry standard and brand Introductory content. Website Database Collection – 10, 000 web master contacts ready for email campaign. This stage is very crucial in terms of positioning affiliate program in the market, the characteristics and USP of affiliate brand need to be taken in consideration. 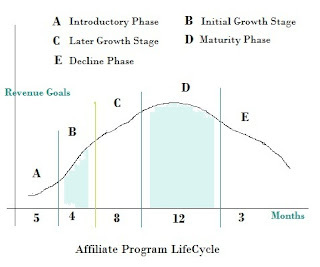 Early growth phase is very important in terms of overall affiliate brand and program success; we have to fulfill lot of expectations. Expectation from market or niche, affiliate expectations, management expectation and more impotently our own expectation from our own brand. Personally meet your super affiliates and convenience them to work with you in near future.